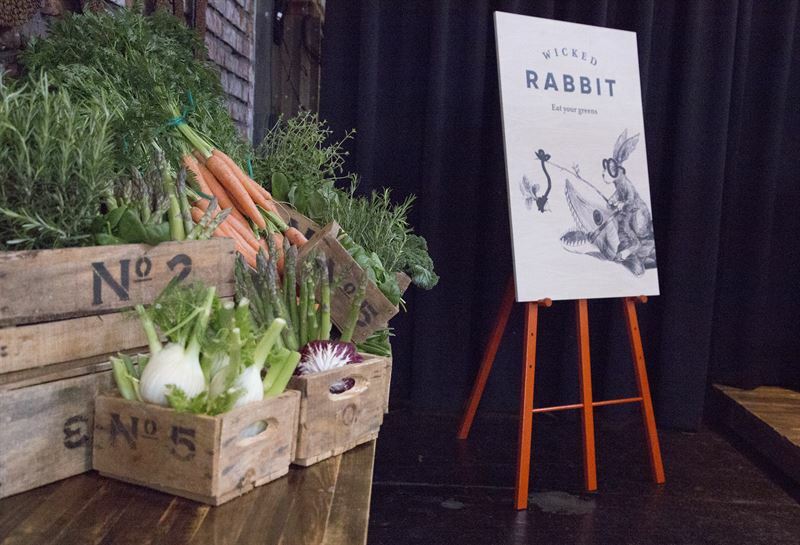 Fazer Group, a partner to EAT since 2014, participates in the Stockholm Food Forum on 11-12 June and serves taste bites from its vegetarian restaurant concept, Wicked Rabbit. EAT aims to transform the global food system from a climate, health and sustainability perspective. For Fazer it is an opportunity to share its innovative products and services and to highlight food as the solution. On 11-12 June, leaders in business, politics, science and civil society will gather at the EAT Food Forum in Stockholm. The purpose is to share knowledge and explore new solutions in order to achieve a healthy and sustainable food supply and distribution for a growing global population. Fazer Group will participate as a business partner, and the ambition is to initiate conversations about sustainable food production and to introduce innovative, sustainable and healthy products such as the Fazer Cricked bread, Froosh smoothies and vegetarian snacks offered by Wicked Rabbit, Fazer’s new restaurant concept. “Our mission is Food with a purpose. EAT, with its vision that healthy and sustainable food should be available to all the world's inhabitants, has been encouraging the development within the food industry since its start in 2013. We see that our role is to share insights about the food of the future and to take action”, says Andreas Berggren, MD of Fazer Food Services. During EAT, Fazer will highlight its work on the development of sustainable meal concepts. Participants at the event will be able to experience the vegetarian concept Wicked Rabbit. Small taste samples will be served, including vegetarian treats such as salad made from “ugly vegetables”, which do not look perfect but are just as tasty and completely usable, or raw snack bites with dried fruit, oats and almonds. As part of the “Disruptive Dialogue” discussions at the EAT Food Forum, Fazer will also introduce the world’s first "cricket bread", developed to meet the need for new and sustainable sources of nutrition. Introducing the eating of insects to people in the Western world can be a sustainable action and a future way of providing alternative sources of protein. “The global food system is currently failing both people and the planet. In addition to the double burden of malnutrition, the epidemic of diet-related diseases and climate change, food systems are major drivers of environmental degradation. With business as usual, we will never achieve the Paris Climate Agreement, nor the UN Sustainable Development Goals (SDGs). Food need not remain one of our greatest global threats. It can become our key for breakthrough solutions,” says Gunhild Stordalen, founder and executive chair of EAT. We work to ensure that our raw materials, such as cocoa, grain, palm oil and soy, are produced responsibly from a social and environmental point of view. High-quality products can only be made with high-quality ingredients. We work with thousands of suppliers, and part of our corporate responsibility is to ensure that they operate sustainably as well. Grain farming has an impact on biodiversity and is one of the causes of eutrophication. Together with farmers, we have developed Sustainable Grain Farming Principles. We work to reduce chemical use in farming while maintaining good productivity. The Sustainable Grain Farming Principles are part of our Baltic Sea Commitment. EAT is an international non-profit organization headquartered in Oslo that works to transform the global food system from a climate, health and sustainability perspective. Our vision is a future where healthy and sustainable food is affordable and accessible to all. EAT connects leaders and innovators across disciplines – from science to politics, business, civil society and the culinary arts - to close knowledge gaps, translate science into action, scale up solutions, raise awareness and create engagement. EAT has a track record of hosting impactful events, including the annual EAT Stockholm Food Forum, the Asia-Pacific Food Forum and events at the UN General Assembly.